Includes: 31cm Carbon Steel Wok and lid, tempura rack, 2 cooking sticks, 8 chop sticks, stainless steel turner, and Ken Hom recipe book. 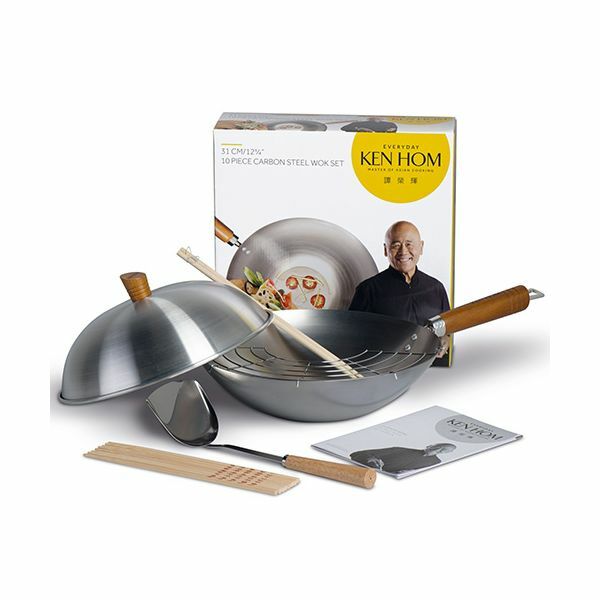 Ken Hom Everyday Carbon Steel Seasoning Wok, combing traditional seasoning methods with a solid structure. Includes: 31cm Carbon Steel Wok and lid, tempura rack, 2 cooking sticks, 8 chop sticks, stainless steel turner, Ken Hom and recipe book. Over a period of time, with seasoning, the wok will build a natural patina (non-stick) surface.